'Hellboy Winter Special 2018': The Horror News Network Review - Horror News Network - The Horror News You Need! There are two thing that you can count on during the holiday season: there will always be left-over fruitcake and the arrival of a jolly, red faced, barrel-chested icon. 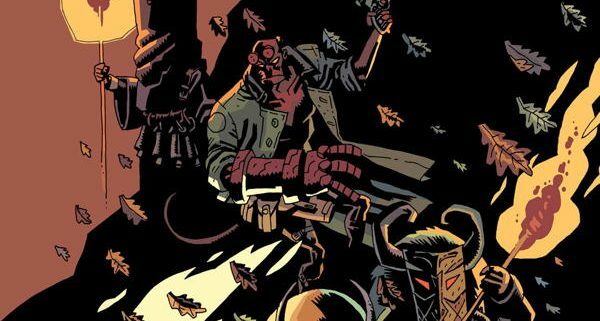 I am of course talking about Hellboy and his annual Winter Special. This year’s 2018 collection contains three seasonal tales featuring a classic Mike Mignola and Ben Stenbeck collaboration about a New Year’s Eve seance gone wrong, Fabio Moon and Gabriel Ba’s return to B.P.R.D. : Vampire with a new story entitled “Lost Ones”, and “The Empty Chair” starring Lobster Johnson by Tonci Zonjic. 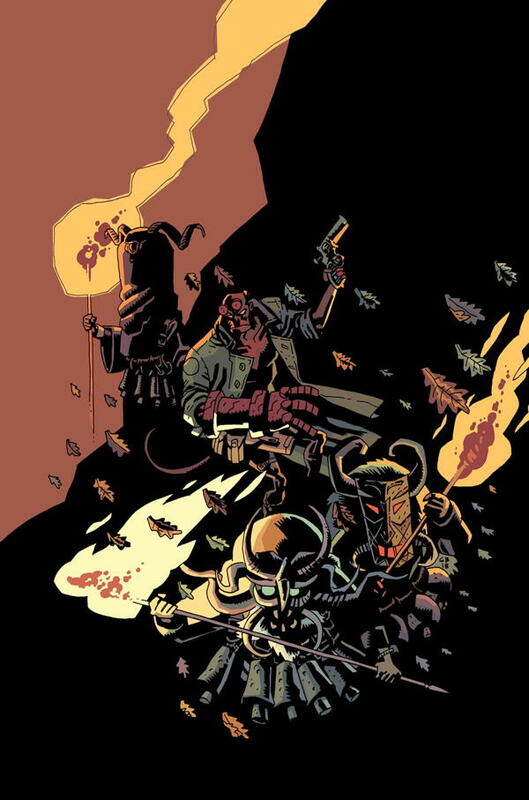 Mignola and Stenbeck’s “Happy New Year, Ava Galluci” captures all of the aspects that one expects in a Hellboy story: a wary, skeptical, sarcastic protagonist, individuals dabbling in forces that they can’t understand or control, and a slug fest of epic proportions. 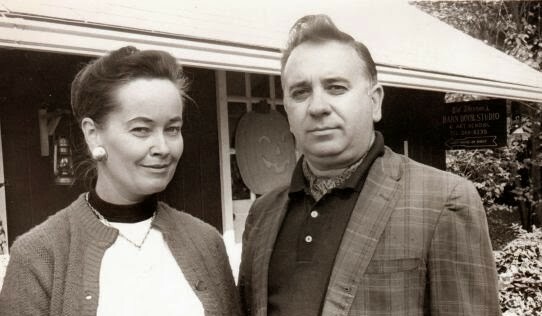 This type of short story is a perfect primer for anyone unfamiliar with the character, and also the perfect way for them to get hooked. It also highlights how “human” Hellboy is, much more so than the frivolous individuals attempting to conjure the dead. Speaking of the dead, if you were to remove Hellboy from the story altogether, Stenbeck’s art beautifully conveys classic haunted house imagery such as long corridors, winding, rickety staircases, and sinister family portraits. These set the scene (straight out of a Hammer Horror film) for the eventual appearance of our ghostly zombie and Stenbeck’s version in one of the best in recent memory, with all the signs of a watery grave riddled across his body. “Ava Galluci” is a classic start to this collection. 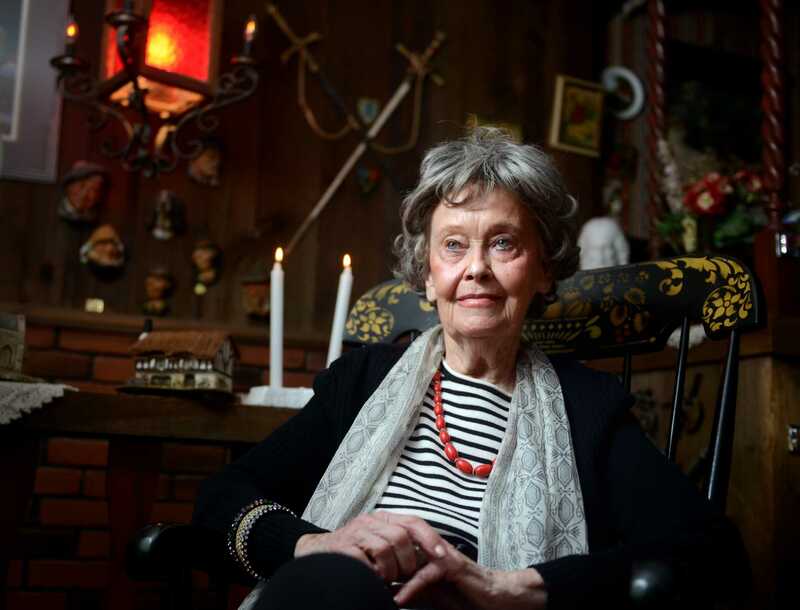 “Lost Ones” shifts the focus to another classic horror setting: Bulgaria and a clash between traditions on the coldest day of winter. While the vampiric Simon returns from B.P.R.D: Vampire, he is there more to mediate a conflict between the tri-goddess worshiping wise women (who some would call witches) and the fertility rite performed by the those swearing allegiance to a male god. The masked men enter the forest in the form of Kukeri, a tradition found in this region similar to the Krampus marches of Germany and Austria. Unlike the Krampus parades, the Kukeri celebrations (which are still performed today) are designed to scare away evil spirits and ensure a fruitful harvest in the spring. Ba and Moon handle both the writing and art chores on this Vampire tie-in, and their distinct style is in direct contrast to Stenbeck’s detailed horror illustrations. The men dressed in their Kukeri costumes almost seem like children at first (possibly a metaphor for their behavior) and when they face the wise women of the forest, they don’t seem any older or braver, especially when a giant bear and red-eyed vampire appear on the scene. 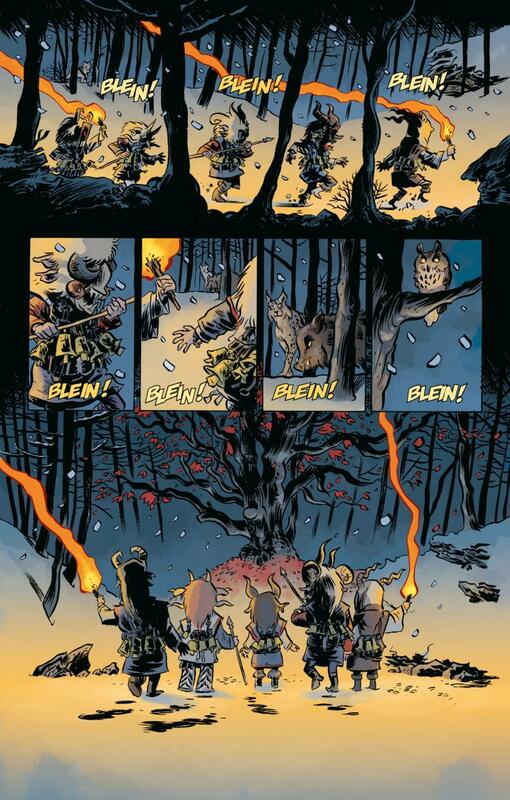 Their tale allows the Vampire series to continue in the future, but more importantly, “Lost Ones” provides an inside look at previously unknown winter traditions, another aspect of the Hellboy series and these specials in general. Also handling both the art and scripting in his story, Tonci Zonjic’s returns to Lobster Johnson territory with “The Empty Chair”. Zonjic’s story finds some typical 1930s gangsters plotting the demise of their rivals, intentionally using the Lobster’s signature “brand” to scare off and dispose of them. As the Lobster quickly points out, there is no excuse for “plagiarized justice” and the chase is on. Zonjic’s art is very cinematic and fluid, jumping from long shots of the city, to close ups of the faces of people like Vinny “The String, to wide angled sprints across roof tops. The pacing of the story keeps up the brisk storytelling elements and any fan of pulp fiction heroes who was unfamiliar with Lobster Johnson before, won’t forget him after “The Empty Chair”. Readers can only hope that we will see more Lobster stories by Zonjic in the future. 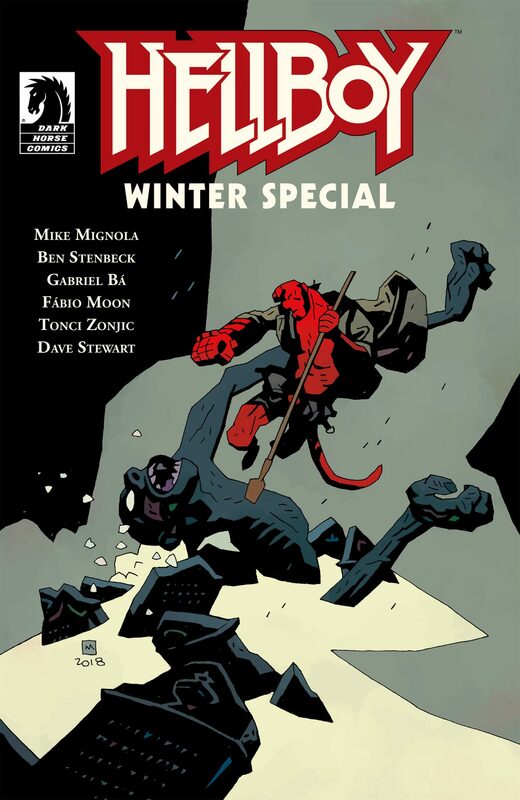 The Hellboy Winter Special 2018 comes in three editions with three different covers: the standard Mignola cover and two variants by Moon and Ba, respectively. All issues are currently on sale at finer comic book shops everywhere.